There you'll find hundreds more happy customer photos. I got my ring sling in today and just wanted to let you know how amazingly beautiful it is! It came at the perfect time because today is our big shopping day of the week. I looked at several youtube videos on how to use the sling before we headed out, and let me tell you, it was a dream. We spent about an hour shopping for our major groceries. Usually we can only get about 30 minutes at the store with our son in his stroller/carseat combo before he's had enough and gets fussy. However, today with him in the vertical heart to heart hold, he slept the majority of the time and after he woke up during the last 10 minutes, he just looked around and was a total angel. I cannot thank you enough for this product! Not only does it look great, it's easy to wear and my son Aiden was very happy in it. Breastfeeding friendly- the tail is a perfect nursing cover while baby's breastfeeding.. Thanks Christie. I can't tell you how much I love my new sling! :) And thanks for your awesome customer service. Got my sling today! Thank you so much! I put my sling on and in less than two minutes B (10 weeks old) was passed out. :) Your product is amazing. Thank you so much! Just wanted to tell you that I LOVE the sling. I really appreciate the great customer service. I've had my sling for about a year now. My daughter is 16 months old and 23lbs and this is still our favorite carrier. I've actually sold off all the others. We don't go anywhere without it. I'm now trying to decide if I should buy a second or not! I've gotten lots of compliments on the fabric. It's held up fabulous and I recommend them to all! Thank you again, you have a great product. I'm really impressed by how sturdy it turned out to be. I ordered my sling so I would have it in time to use at a 3 day long convention I attended. We forgot it the first day so my eight week old little girl was a bit fussy, being surrounded by four thousand people and the noise they make. The second and third days I put her in our new ring sling and she slept contentedly for hours on end. We both LOVE it. And it saved my poor arms the torture of trying to support ten pounds of baby for three days. I received tons of compliments on how pretty the sling was and everyone had to peek inside to see what was in the tiny bundle. Once again, thank you very much! Well, I just purchased my second sling from Christie. I absolutely LOVE it. Again...customer service is the best you can find and shipping is super fast. I use both of my slings all the time and have not had any problems with it at all. They are so soft but very sturdy. These slings are not only great for my 4 1/2 month old but my 2 1/2 year old also loves to be in it. We just spent the day at the mall and she wanted to be in it so badly that I put the baby in the stroller (he loves that too) and wore her on my hip around the mall. No problems, no pain. When it was time to get her out she said, "No, Mommy...I stay in this, I love this" It was so sweet! I have recommended Christies slings to several people. My sister just purchased her first sweetpea sling and is already in love with it. We are both anxious to browse her new fabrics and buy another one :-) If you buy a SweetPea Ring Sling, you will NOT be disappointed!!!! I still love my sling and actually used it yesterday to hold 20-mo-old Carissa while I vacuumed. She fell asleep, of course. My sling is still in PERFECT shape after almost 2 years of hard use, I get compliments on it every time I wear it in public, and I hang it next to my bookshelf when not in use because it's so pretty it works as wall art, lol. I can't wait to find out what gender this baby will be so I can order another sling for him/her. Just wanted to let you know...I LOVE my sling. The fit is great, so comfortable. I have been using it everyday and it is absolutely wonderful. The sling is so cute and comfy too! The shoulder isnt bulky like other slings, and it's really sturdy. Very comfortable and stylish to boot! I received the sling very quickly. Seller went out of her way to find the fabric I really wanted.. very personal service! 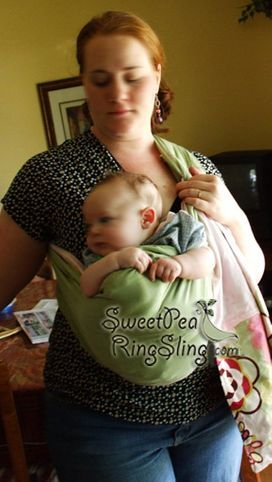 What I love most about my SweetPea ring sling is just how much my baby enjoys it. I also love how discreet it makes breastfeeding in public. With the ring sling, I can multi task which is wonderful. I would absolutely recommend it to anyone because it just makes life with a baby so much easier and so much more fulfilling. I adore my sling and I'm so addicted, I think I'll buy more. 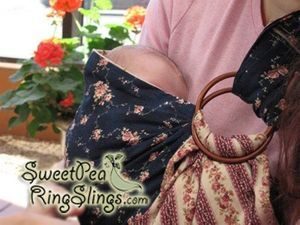 Where were the SweetPea ring slings when my kids were babies? I've been introduced to them as a grandmother. I love the freedom of movement and support it gives to me and baby and use it every chance I get. Thanks Sweet Pea! 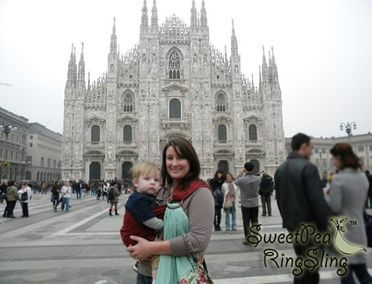 My Sweet Pea ring sling is a LIFESAVER - it makes running around with a baby and a toddler feasible. It lets me hold Patti while tending to Brendon, and even lets me safely carry both at once. And it's a Godsend for the times when I'm in stores with only one shopping cart seat, since Brendon's not quite ready to walk in stores yet. I have been using my sling with my son since he was born, and I can't tell you how much I love it! I can only remember forgetting to have it with me one time, and that was an experience. We had to chase him, and carrying him without it was painful. I sure learned my lesson that day, to never forget my sling! Thanks for making such a great product! Beautiful and handy! I got my sling yesterday, and it is beautiful! I love the gray you chose! I used it last night at church and today while out and about, and it is wonderfully comfortable - I love the way the shoulder feels, there's no pressure anywhere. I wanted something more dressy than my MayaWrap, and this is not only prettier, it's more comfy. I was concerned the double layers might be too warm, but they're not. Now if only I could convince hubby that I need more slings.....yours are so pretty. Thanks so much! I am so happy that I bought this. I bought one about 5 months ago from your website and I wear it daily. I have 7 slings and yours are the best! I am going to sell most of mine now an only keep yours because I never use the others anymore. Yours is so comfortable and easy to wear. I am wearing it right now. I also love this print it is so cute!!!! Baby snuggles up and falls asleep! Great for moms with other toddlers around! Love the new sling! Sturdy and cute! Thanks! Beautiful sling, quick shipment, thanks for the great transaction. Fast Shipping. Great Customer Service. Wonderful Sling. Thankyou! Sling arrived quickly. Great product - my baby loves it and so do I!! Very Helpful, fast shipping. Well worth the $ amount spent!! We both love it! Great seller. Quick shipping. Web site very helpful for using sling. great product! I immediately tried it on my 2 y/o and she loved it! Thanks! Thanks for the fast shipping!!! I could't wait for it to get here! Thanks!!!!! Great product!!! I love my new sling! Also, it shipped really quickly as well! Near overnight delivery! Excellent and sturdy. I LOVE my ring sling...very well crafted and excellent shipping service. Beautiful sling! Bought for newborn, but my 28 lb. son fits in it great too! Quick shipping, perfect condition, works great, thanks! baby loves it! Cant wait to use the sling!! Great detail even my mother in law said so. SHOP for your new sling!